I am still working on my shop, but I thought I should just announce it now rather than waiting till when ever I get around to finishing everything. 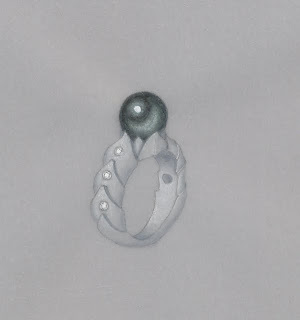 Lark is doing another book, 500 Silver Jewelry Designs. Entries must be postmarked by Dec. 4, 2009. Last week I was going to get my entry ready, but I decided to wait and try to get my green enameled bracelet finished in time to enter. It would have been finished by now, but I got really busy with other things. I love postmark deadlines. They are so much better than having a deadline for when the entries are received. It's much easier when you are finishing something, and photographing it on the very last day. You don't need to worry about shipping the entry next day delivery. I actually don't do that sort of thing anymore. I'm too lazy. But a lot of people do. Instead I have several times gotten myself in the situation where I photographed a piece when it wasn't 100% finished, like some part not visible in the photo was not finished, so I could enter it in an exhibition or something. Then stopped working on it till I got the notification that the piece was accepted and ended up having to stay up all night finishing the piece so I could send it to the exhibition. I hate all nighters, but I procrastinate so much they happen more often than they need to. I just found out there's an exhibition about diamonds at The Field Museum in Chicago till March 28, 2010. Tickets are $29(!!!). I might go. I'd like to see it, but I hate going into the city, and its going to end up being a $50+ trip, so I don't know. 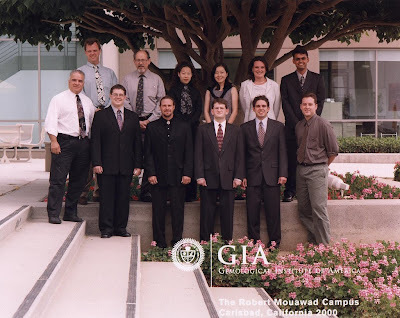 It's been 10 years since I moved to Oceanside, CA to go to the Gemological Institute of America in Carlsbad, CA. I can't believe it's been that long. This is significant to me because I feel that GIA was the start of my professional career. 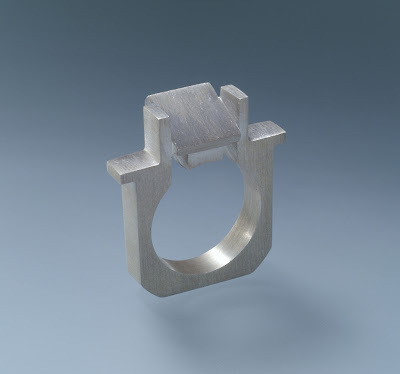 I had been working in metal since Aug. 1996, but it was more of a hobby before I went to GIA. 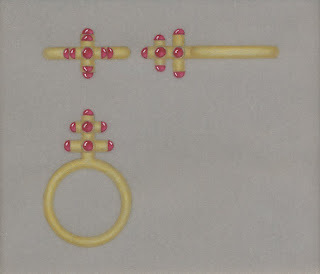 While I was there I took, in this order, the graduate jeweler (GJ) course, wax carving, graduate gemologist (GG), jewelry design, and a short advanced stone setting class. In the GJ class and wax carving class everyone makes the same thing. 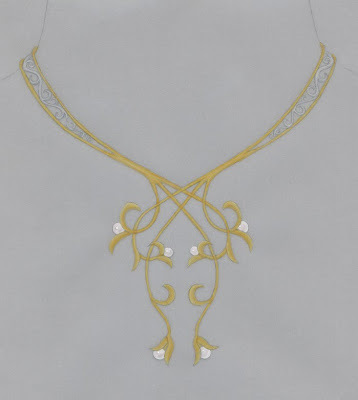 So I didn't make any of my own designs during the GJ class. I was able to do some of my own waxes during the wax carving class because I finished many of the assigned pieces quickly. I didn't cast it till a couple years later, but the wax was finished in 2000. I started putting my enameled bracelet together yesterday. It's going ok now, but started out pretty badly. I have several more rows of pieces to put on it. I also have to fabricate the catch. 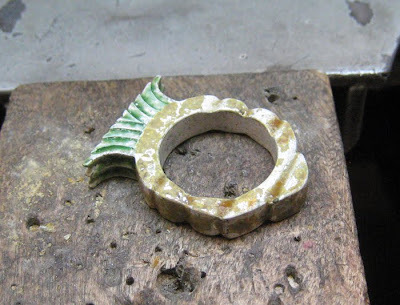 I also worked on my carrot ring. I'm removing the orange enamel. 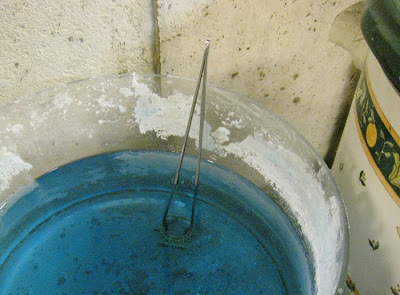 I decided to heat it and quench it to break off the enamel. I did that several times. It's interesting that when you do that the enamel keeps cracking and chipping off for several minutes after it has cooled. There's still some enamel on it, I guess I will have to grind the rest of it off. 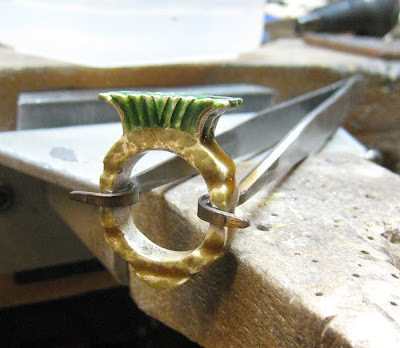 I am back to working on my green enameled bracelet. I hope to finish it next week. Yesterday I went to SOFA even though I hate going into the city. It was ok. I saw some really good work and some really bad work there. Yesterday I also got an email from Lark Books inviting me to submit images for a book about plant inspired artwork. They say that it is "highly likely" that at least one of my images will be used for the book. I will believe it when I see it. From my experience the "sure things" always seem to be the things that don't work out. The other day I prepared some wood for lock pick handles. Usually I buy the wood cut as "pen blanks." 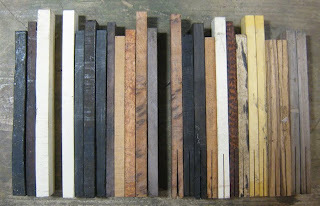 Pen blanks are small blocks of wood about 3/4" x 3/4" x 6" used for making pens. Of course you could buy a larger piece and cut it smaller, but pen blanks are cheap and convenient. My only wood working experience was a job I had about 11 years ago sanding and staining Adirondack chairs. Since I don't know much about wood working I just treat the wood like metal and that's been working out ok for me. 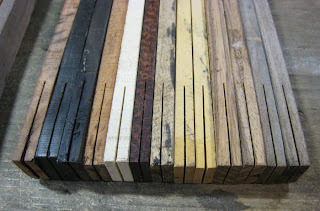 I get 2 handles from each pen blank by cutting the wood down the middle with my band saw. After I cut the pen blanks down the middle I cut the sides parallel to each other with a fly cutter on my Sherline mill. 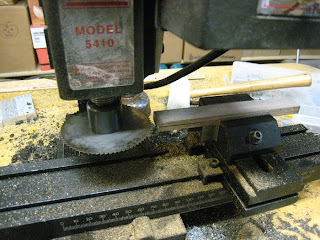 Next I use a slitting saw on the mill and cut the slot for the pick blade. The slitting saw is about the same thickness as the steel I use for the pick blades. The wood is now ready for me to make into a handle.